Would you build a $300k home on property you couldn’t possibly own? The term “boat house” probably conjures images in your mind’s eye of rickety weathered steps down to the water’s edge, corrugated sheet metal, spider webs, yellow bug lights, dust, rust and tangled fishing gear. There may even be that last lonely can of beer in the fridge; still snuggly bound by its plastic six pack girdle. Some of these boat houses have morphed into fully fledged lake houses. However, because on Lake Texoma, boat house owners typically cannot own the docks that their boat houses are built upon, the title to the boat house is loosely analogous to that of a condominium. Hence the term “dockominium”. On Lake Texoma and on lakes and shorelines across the nation dockominiums are being bought and sold—left and right. The trend began in the early 1980s along the coastlines of Florida, Georgia, and North Carolina as boat owners sought to spend more time on the water at a time when Mother Nature and government agencies conspired to limit available waterside access. It was a classic case of supply and demand. On the Atlantic and Gulf coasts where hurricanes have reduced the number of wet slips available for rent, marina owners have begun to replace smaller slips with a smaller number of larger, more expensive docks that can accommodate slipholder improvements. Initially, the idea was to get a head start on the weekend by having a place to store supplies and equipment as close to the boat as possible. A large equipment storage box would be placed on the dock next to the boat slip. Later the owners might add a picnic table and a couple of lawn chairs. More elaborate installations might include a grill and a mini-fridge. Over time, with imagination and ingenuity, bigger, better, improvements were made; enclosing them from the weather and adding creature comforts such as carpeting, air conditioning, sinks, ice makers, toilets, satellite TV, bedrooms, washers and dryers, pool tables, etc. Di Jourden, leasing manager at Highport Marina and Resort has been working on Lake Texoma for many years and she has seen the trend to larger and more elaborate dock development by slip renters. But nothing like the growth of dockominiums in the recent year. “Last year we marketed just under 20 units,” said Jourden, “and this season we have only 3 on the market. But that changes daily.” What’s the average price of a really nice dockominium? Jourden says there is no such thing as average when it comes to these floating condos. Jourden reports that prices begin at $36,000 for a small single-room unit and one sold recently for nearly $300,000 that features 2 stories, 3 bedrooms, 2.5 baths and a commanding view of the lake from the private second story deck. Setting over the water, dockominiums offer luxury living. Dennis Kissman is a writer for the industry magazine, Marina Dock Age. “The national average rental on a wet slip is $20,000 annually and the current shortage of available slips nationwide is at over 500,000 and increasing at a rate of 100,000 a year,” Kissman reports. Not only are governments restricting development on many waterways, what little waterfront property is available for permits is being seized by large development corporations for condominium and hotel projects— further eliminating or greatly reducing the dockage available for recreational boaters. On some lakes waiting lists for larger slips can easily be several years long. It’s not unusual for a slip to be available only when someone dies or divorces. Beyond the business aspects of building, buying and selling dock space is the end result—having a place to relax and enjoy the lake life. 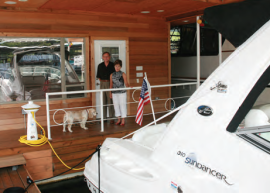 Steve Burrage, Chairman of First Bank in Antlers, Atoka and Coalgate, Oklahoma , and his wife Roberta, recent empty nesters, year around, typically spend at least three weekends a month at their dockominium at Grandpappy Marina on Lake Texoma. They love the changing seasons on the lake and they love their community of friends who share their dock and who often gather for dinner and cocktails. felt the need for expanded sleeping and eating accommodations. Fortunately, Steve’s brother was already experienced in building “dockominiums” on Lake Texoma so he knew what would work both functionally and aesthetically. He oversaw the build-out of the boat house, including assuring that the construction complied with all building codes and obtaining all necessary Army Corp of Engineers permits. All Steve needed to do was write the checks; which he did, to the tune of around $200 per square foot. The end result is a truly livable and lovely indoor/outdoor home away from home. Roberta enjoys her gourmet kitchen with stainless steel refrigerator/freezer, electric range and oven, microwave, dishwasher and slate counter tops, while Steve gets to entertain the boys on his upstairs covered deck bar and grill as they watch the game on a flat panel satellite TV. For that matter, every room in the house, including the outside decks, is wired with surround sound and satellite HD television. Steve also has broadband Internet access so that he can access his network back at the bank while he is sitting on his deck. 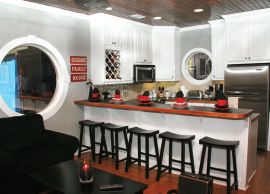 The downstairs den opens directly onto their dock and boat so that going out for a cruise is actually easier than backing your car out of your garage. The king size master suite contains built-in cabinets, tiled bath room andgreat unobstructed views of the lake from large “port hole” windows above and on either side of their bed. The sitting room adjacent to the master suite is furnished with a fold-out sleeper sofa and chair to accommodate guests. On Sunday evenings, after the guests have gone and the marina quiets down, Steve and Roberta enjoy sitting by the water with their sundown cocktail, feeding the ducks and giving thanks for their wonderful life.